The Burgess Shale arthropod exhibits characters in common with trilobites, most notably, limb morphology, a cephalon, and hypostome. 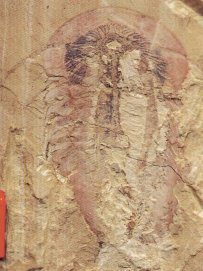 Tegopelte gigas, a large Burgess Shale species that Fortey & Theron (1994) considered a naraoiid, but other analyses place in another clade, the Tegopeltidae. a discussion of the relationship of trilobites to other Paleozoic arthropods, and descriptions of other close trilobite relatives. for a pictorial guide to the specific features that define trilobites. to see how trilobites develop through three growth phases. a discussion of the many directions that trilobite evolution has taken. When the Burgess Shale arthropod Naraoia compacta was examined and redescribed (Whittington 1977), it was very similar to trilobites in limb morphology, in the possession of a hypostome and cephalon, and in cephalic limb-number. However, the cephalon was eyeless, transverse, ovoid, and largely lacking dorsal features, it lacked any discernable thoracic segments, and perhaps most fundamentally, the exoskeleton was not hardened by calcium carbonate as in trilobites (the specimen shown at left had a fold in the cephalon indicating its flexibility). The trunk was prominent and much longer than the cephalon, which was quite different from the typically micropygous primitive trilobite pygidium. Nor was Naraoia compacta the only representative of this kind of animal. The Chinese Chengjiang deposits also yielded at least two species of Naraoia, as well as another closely-related genus in the family Naraoiidae, Misszhouia (see Chen & Zhou 1997, Zhang et al 2007). Examination of Cambrian and Ordovician specimens added species in the family Liwiidae that are similar to Naraoiidae, but bear thoracic segments. Finally, a Silurian species of Naraoia (N. bertiensis Caron et al 2004) extended the naraoid clade well beyond their Cambrian heyday. Below are some figures of representative naraoiids/liiwids. 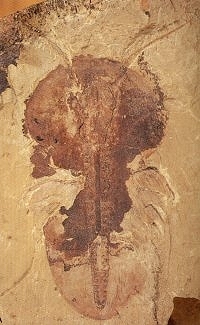 Naraoia spinosa, from the Early Cambrian Chengjiang deposit, Yunnan, Southern China. Misszhouia longicauda also from the Chengjiang konservat-lagerstatten Tariccoia arrusensis, an Ordovician naraoiid from Sardinia, Italy. Soomaspis splendida, another Ordovician naraoiid from the Soom Shale, South Africa. The similarity between the limbs of naraoiids and primitive trilobites is quite striking. Based on limb structure alone it would seem incontrovertible that trilobites and naraoiids belong to the same clade. The limb reconstructions of the naraoiid Misszhouia longicaudata and the trilobite Eoredlichia intermedia demonstrate this startling similarity quite clearly. In the two reconstructions above, the podomeres (leg segments) of the endopod (walking limb) are numbered, while the gill- bearing exopod is shown attached above, unlabeled. In life, the exopod would have been held perpendicular to the endopod (i.e., turned so that the gill filaments are pointing away from the viewer), but when individual limbs are preserved, the orientation shown above is commonly seen.This suggests that where the exopod and endopod are joined along the top of the coxa there is a flexible hinge-like joint that allows the gills to be held relatively stationary as the limbs move. Order Nektaspida of the Class Trilobita? Based on the similarities to trilobites (particularly limb similarities), Whittington (1985) considered Naraoia and its relatives to be members of an order of trilobites (Nektaspida) that lacks a calcified exoskeleton (he called them "soft-bodied trilobites"). Some analyses place species such as Naraoia, Misszhouia, Liwia, Buenaspis, Tariccoia, and Soomaspis closer to trilobites than to any other known arthropod clade, although they lack some important trilobite features. In his discussion of the relationship between naraoiids and Trilobita, Fortey (1997) suggested that the handful of naraoiids did not require ordinal status, and they would be treated as trilobites of uncertain ordinal status, based on their many similarities to calcified species. The proposal to include Naraoiidae in the Class Trilobita is by no means unanimously supported. The naraoiids (and liwiids) could conceptually be included in the class Trilobita (with uncertain ordinal status, as Fortey proposes, or as a full order, as Whittington and others have suggested). However, although some cladistic analyses (e.g., Wills et al 1998) bring the Naraoiidae into the same clade as Trilobites, others (e.g., Edgecombe & Ramskøld 1999, Cotton & Braddy 2000, Zhang et al 2007) separate them distinctly among early Paleozoic clades. Cotton & Braddy (2000) place the pygidium-bearing arachnomorph families such as Helmetiidae and Xandarellidae closer to trilobites than the Naraoiidae or the Liwiidae. Moreover, in those analyses, the Tegopeltidae are removed from the Naraoiidae, since the Chengjiang tegopeltid Saperion clearly bears ventral eyes on stalks. By 2007, clarified by the excellent preservation of the Chengjiang fauna, Zhang et al flatly excluded naraoiids from the Trilobita, while further clarifying the relationships of trilobite-like arachnomorphs. The normal progression of growth and development in a typical trilobite begins with a protaspis of 0 segments (far left), a series of meraspid stages with increasing numbers of segments, leading ultimately to a holaspid with the adult number of segments (far right). Via progenesis, normal protaspid to meraspid metamorphoses occur, but sexual maturity is reached in the early meraspid larval stage of a normal trilobite, leading to mature, but miniscule individuals with few segments, the typical state of Agnostida. In contrast, hypermorphosis in naraoiids results in a higher growth rate, but development is greatly suppressed, leading to large adults that resemble gigantic meraspid larvae with zero or few thoracic segments. Fortey and Theron (1994) suggested that because of the distinctly different developmental routes to produce naraoiids vs agnostids, their superficial similarities (few thoracic segments) were not sufficient to argue for a close phylogenetic relationship. Their differences (e.g., small size in Agnostida, non-calcified exoskeleton and macropygy in Naraoiidae) argued they belonged to distinct clades. Agnostida arguably represents a secondary loss of eyes, reduction in size and segment number, and specialization of limb form and function within the trilobite clade, while the Naraoiidae never developed dorsal eyes, calcified exoskeletons, or the numerous segments of the typical trilobite, yet share the primitive limb form of most arachnomorphs, including trilobites, helmetiids, tegopeltids, xandarellids, and naraoiids. Chen, J. & G. Zhou. 1997. Biology of the Chengjiang Fauna. in The Cambrian Explosion and the Fossil Record. Bulletin of the National Museum of Natural Science 10:11-106. Cotton, T.J., and S.J. Braddy. 2000. A "big hand" for the chelicerates? Phylogeny of arachnomorph arthropods and the origins of the Chelicerata. Young Systematists Forum. Edgecombe, G. D. & L. Ramskøld. 1999. Relationships of Cambrian Arachnata and the systematic position of Trilobita. Fortey, R. A., and J. N. Theron. 1994. A new Ordovician arthropod, Soomaspis, and the agnostid problem. Palaeontology 37(4):841-61. Fortey, R.A. 1997. Classification. In Kaesler, R. L., ed. Treatise on Invertebrate Paleontology, Part O, Arthropoda 1, Trilobita, revised. Volume 1: Introduction, Order Agnostida, Order Redlichiida. xxiv + 530 pp., 309 figs. The Geological Society of America, Inc. & The University of Kansas. Boulder, Colorado & Lawrence, Kansas. Whittington, H. B. 1977. The middle Cambrian trilobite, Naraoia, Burgess Shale, British Columbia. Philosophical Transactions of the Royal Society of London, Series B. 280:400-43. Whittington, H. B. 1985. Tegopelte gigas, a second soft-bodied trilobite from the Burgess Shale, British Columbia. Journal of Paleontology 59:1251-74. Whittington, H. B. 1992. Trilobites. The Boydell Press, Woodbridge, UK. 145 pp., 120 plates. Wills, M.A., D.E.G. Briggs, R.A. Fortey, M. Wilkinson & P.H.A. Sneath. 1998. An arthropod phylogeny based on fossil and Recent taxa. In: G.D. Edgecomb, ed. Arthropod Fossils and Phylogeny. Columbia University Press, N.Y.